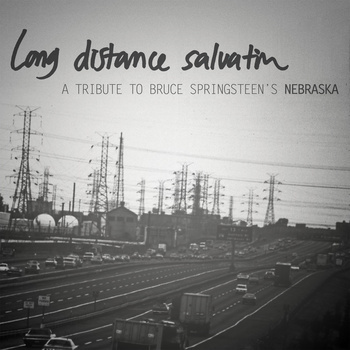 Yesterday the compilation album dedicated to the classic album Nebraska from Bruce Springsteen saw it’s official release. So, if you enjoy a great album covered by great artists for a great cause then I think they got you covered…no pun intended. The album is 10 album and 4 bonus tracks featuring artists such as The Wooden Sky, Strand of Oaks, Roadside Graves, Joe Pug, Juniper Tar, Trampled by Turtles…well the list goes on and is quite impressive for the indie, folky types. So then me. Juniper Tar’s piano laden Atlantic City is a current favourite and is the only track that gets double covered [also a great more folky version by Kyle Morton (Typhoon) & Danielle Sullivan (Wild Ones)]. Strand of Oaks gives his official version of Used Cars that you might have heard on a HearYa Live Session a while back…still a keeper if I had to say. Adam Arcuragi brings the bluesy acoustics to Reason To Believe that beautifully closes out the last of the album tracks before the bonus cuts kick in. Like I said above, the list goes on for talent on this album and I could individually post each one but let’s leave a bit to the imagination and as an incentive to head over to the bandcamp page for a full stream! So all this is essentially about the music, but this whole project and compilation came together to benefit Project Bread who’s aim is about “alleviating, preventing, and ultimately ending hunger in Massachusetts“. Well a state themed benefit album for a state – seems fitting enough. Find out more on the album and the project at www.longdistancesalvation.com. Purchase the album via Bandcamp (I am waiting on my delicious coloured vinyl version to arrive). The digital is only $5!! Best deal you will find anywhere today – I guarantee it.